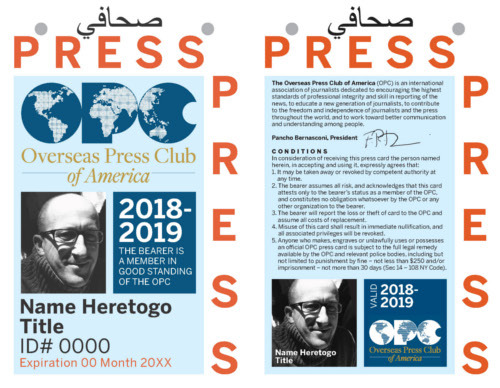 We have signed up a new printer to make the large, government-style OPC press ID badges. We can now print badges as often as once a month, and have cut the price to $40 from $50. The dues year started Oct. 1, so if you order now the badge will be valid for 11 months. To request a badge, email patricia@opcofamerica.org and attach a color, high-resolution, close-up face shot. (No profiles or black-and-white photos, please). All members who have paid their dues for 2018-2019 can order a badge. You can pay via the link below. As always, the credit-card sized press ID is available for free upon request.